Reduce Window Condensation before it starts producing mould! To reduce window condensation is an important step in controlling mould incubation in your home. More information about issues around mould can be found on our Moisture and Mould page. It is also important to understand the causes of moisture and mould. In this article, we focus on how to reduce window condensation. It is true to say that human activity increases the indoor moisture levels. Cooking, taking showers and even breathing, all increase indoor humidity. 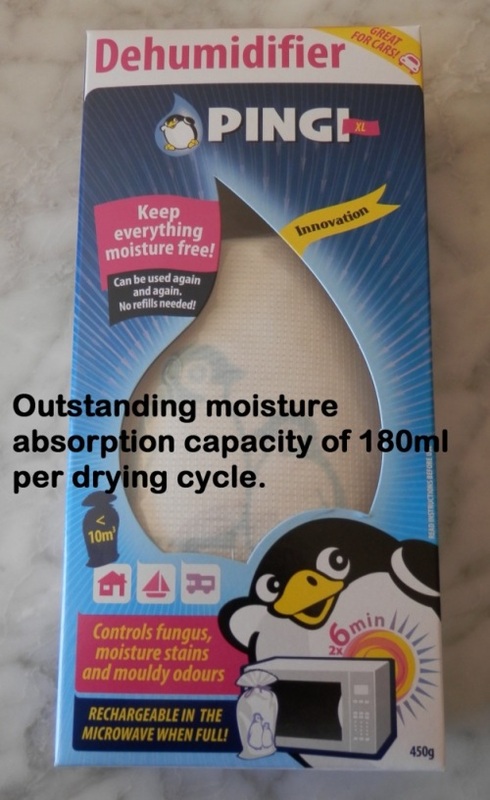 Our non- electric large Pingi XL can absorb up to 180ml of moisture per cycle. Placing these products next to a problematic window will help reduce window condensation. Order your PINGI XL at our Shop. Have a look at our Moisture Absorber Specials page for great value! Just click on the link. Reduce window condensation, prevent excess mould and improve indoor air quality. Our homes are the places where we spend most of our time. It is important to try and maintain the healthiest home possible. The Pingi XL can be place right next to the source of condensation. No leakage as the silica gel holds the moisture in suspension. The blue moisture indicator on the Pingi changes to light pink as the Moisture Absorber becomes saturated. Our Moisture Absorbers are rechargeable in a microwave oven. This means no refilling and they can be used many times. Get the innovative PINGI XL at our Shop.